Ultrarapid freezing, when used in conjunction with appropriate accessory processing methods has long been recognized to provide reservation of ultrastructure, localization of soluble inorganic and organic species, and preservation of antigenicity that is superior to that obtainable through conventional chemical fixation techniques and the use of cryoprotectants. Furthermore, it is the only procedure currently available for capturing events that occur on timescales less than a few seconds. Successful ultrarapid freezing requires that heat be withdrawn so rapidly from an unfixed un-cryoprotected sample that no ice crystal damage is visible at the electron microscopic level of analysis. This is not a trivial undertaking, and until recently, the improvements gained through ultrarapid freezing were often paid for in terms of decreasing productivity. However, over the last several years, improvements in methodology and the introduction of refined equipment for the ultrarapid freezing of biological samples has significantly improved both the ease of application of technique and the yield of well preserved samples. The EMS-002 Cryo Workstation allows for a reliable virtually routine freezing of biological samples. Cryo-fixation of suspension and tissues for Cryo-techniques such as freeze fracture/etch, freeze drying, freeze substitution. Economical, universal application rapid freezing unit. Plunge freezing with temperature controlled cryogen. Frozen samples handled under cold dry nitrogen atmosphere. Rapid set up and easy use. High and low set points for cryogen control. The EMS-002 achieves ultra-rapid cooling by quenching the sample in liquid propane or other suitable cryogen, cooled to near liquid nitrogen temperature. 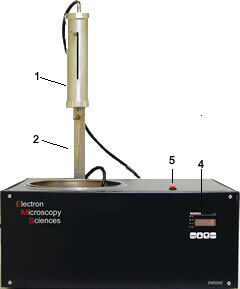 The EMS-002 accomplishes this by using a stainless steel vacuum insulated Dewar and copper condensation chamber. Liquid nitrogen is poured into the Dewar to a level determined by the user. The initial cooling of the cryogen condensation chamber takes about 15 to 20 minutes. Gaseous propane is then admitted to the condensation chamber slowly enough to allow it to condense and fill the chamber with liquid propane. The propane is led to cool to near liquid nitrogen temperature supervised by the digital temperature controller while the sample is being prepared for freezing. The device requires only about 10 minutes to cool to operating temperature after the first filling of propane, and less than five minutes after subsequent fillings. The operator can increase or decrease the rate of cooling by adjusting the level of liquid nitrogen in the Dewar. Heaters built into the chamber wall, powered by the temperature controller, evenly warms the propane above its melting point. The controllers’ temperature is set for the kind of cryogen being used, for instance, 185°C for commercial grade propane. Chemically pure propane (map. 190°C) can also be used, but it is significantly more expensive than commercial grade propane and confers no particular advantage. Ethane and a non-flammable cryogen, SUVA-124 produced by Dupont can also be used as a cryogen in this instrument. When using flammable cryogens like Propane & Ethane we recommend using the EMS-002 in a fume hood. The sample can be prepared using any favorite size EM Grid if the system is being used for Cryo-TEM or Panama hat-shaped specimen carriers for Freeze- Fracture or Freeze Substitution. Once the sample is applied to the EM grid for instance, the excess must be carefully blotted away with a small piece of filter paper. Remember, the goal is to form a thin meniscus of specimen across the holes in the grid. Once achieved, insert the specimen holder in the“Drop Anvil” of the EMS-002. The technique provides higher rates of cooling than can be achieved by plunging the sample into the cryogen by hand because of the high velocity and accuracy the sample enters the cryogen. The optimal plunging speed is approximately 100m per/sec it provides more efficient heat exchange. The freezing is fast enough to capture rapid events and labile structures that are not seen in chemically fixed material. 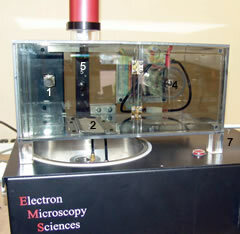 The technique has been applied to many types of specimens: aqueous suspensions and emulsions, tissue culture cells, suspensions of a cells, and tissues. 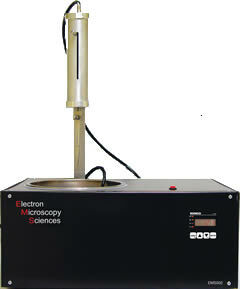 Specimens frozen with the EMS-002 may be freeze fractured, freeze substituted, frozen thin sectioned, or freeze dried. 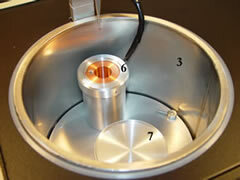 The samples may also be used for Cryo-SEM or Cryo-TEM. This allows the user to set desired holding temperatures of the cryogen being used for the freezing process. Easy to use controller also has settable arms to alert the user that the cryogen is warming up and the unit needs attention before the cryogen reach is evaporation temperature. Some plunge freezing applications will require a controlled environment for the samples to be frozen in a satisfactory manner. The environmental chamber module can provide specific relative humidity and temperatures required for many types of samples. The dry nitrogen atmosphere below the environmental chamber allows us to precisely adjust the relative humidity, upwards, and easier to add water in this case. We choose to control the temperature then manually adjust the humidity by adding small quantities of water to the environment by vaporization. The vaporized water is quickly and evenly distributed throughout the chamber by a circulation fan. The integrated shutter mechanism prevents the sample from precooling before it is rapidly frozen. 1. Temperature & Humidity Sensor: Sends temperature & humidity data to controller. 2. Baffle Comb: Allows used to transfer frozen sample to be transferred to the plunge freezer’s “Work Platform” without allowing the Dewar gas to enter the chamber while shutter is closed. 4. Heating & Vaporizer: This provides a good portion of the heat load. It also serves to vaporize added water if the humidity is too low. 5. Vertical Mounting Bar: Serves to anchor the Chamber to the Cryo Workstation. 6. TEC (Thermo Electric Cooler): This assembly has a solid state device at its center that heats & cools depending on the polarity of the voltage applied. Used for addition heating and cooling but its main function is to lower humidity if the humidity is too high. 7. Shutter Re-set: Plunger is pressed in firmly to lock the shutter in the closed position. 1. Controller: Used to maintain temperature inside of the chamber and MONITOR Humidity only. used to reduce the humidity in the chamber. 3. Aux Heating/Vaporizer Mode Switch: Simple on-off switch to turn on the vaporizing chamber, rapidly adding water vapor to the environment. Allows for the efficient transfer of propane to the condensation chamber from the propane storage vessel. 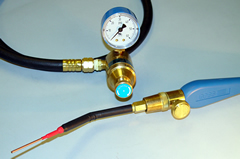 A quite simple device consisting of a Propane regulator, Propane hose 1.75m, handle to control the speed at which the propane flow out of the supply tank. Finally a specially modified tip made of Copper that can be chilled in LN2 so less time is required to fill the condensing chamber. this means less Propane gas being generated during the process, which makes the lab safety people much happier. The regulator is shipped without a connection to the Gas supply since this is different from place to place. Special tweezers specifically for use with the Plunge Freezer that is “self-locking”. Extra sets allow quicker turn around when freezing multiple samples. Clamps designed for human Muscle biopsies to keep the muscle from contracting during fixation. Now it is possible to improve the morphology of the sample by rapid freezing by plunging into liquid cryogen. Fits directly into the drop anvil on the Plunge Freezer. The recycling time of the device is less than three minutes, just long enough for it to be ready when you finish processing the last sample. The operating cost is about 0.47 per sample, depending on the price of liquid nitrogen. The device will operate for about two hours on 10 L of liquid nitrogen, including the initial cool down.